Planning to create a home office design with a touch of tranquility? 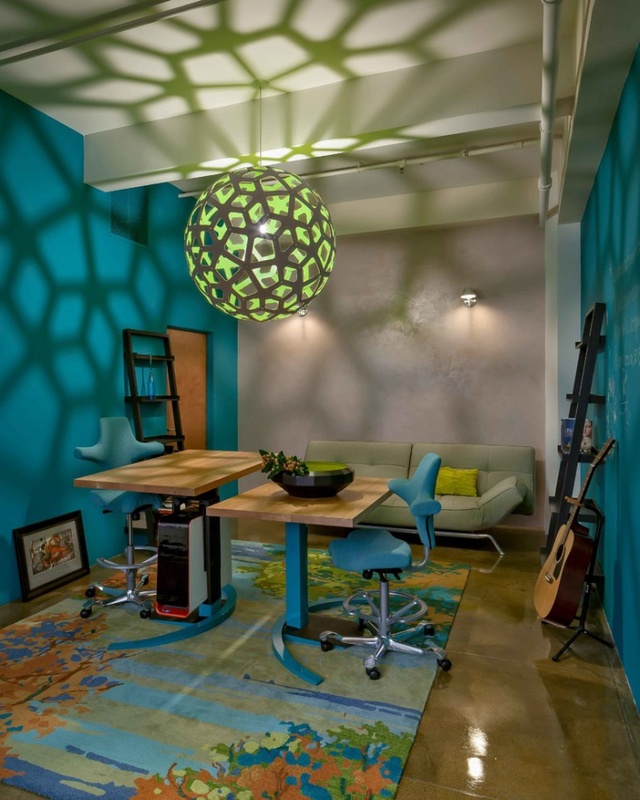 Then, blue-toned office could be an option worth consideration. Blue colour is associated with calmness, loyalty, confidence and intelligence. 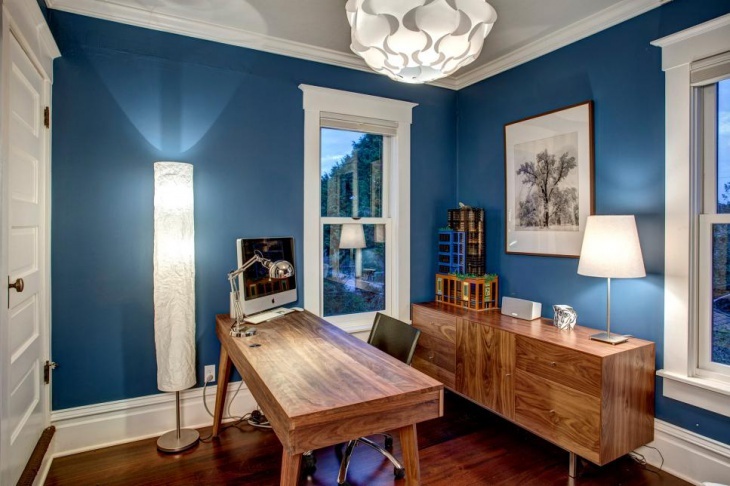 No doubt, these are attributes that you’d like your home office to have. 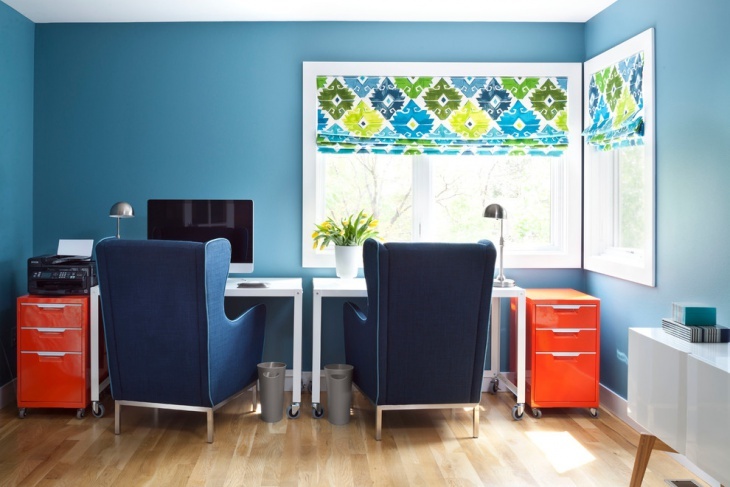 If that’s the case, then read through as we share some of the great designs for creating your blue home office. This design with blue leaf wallpaper will give your office a classic, tranquil touch. Embellishing walls with a favorite artwork gives your office a personalised feel. The cream gourd lamps and the Tang Dynasty Horse artifacts add glamour to the office while the sculpted high back armchair enhances your comfort. 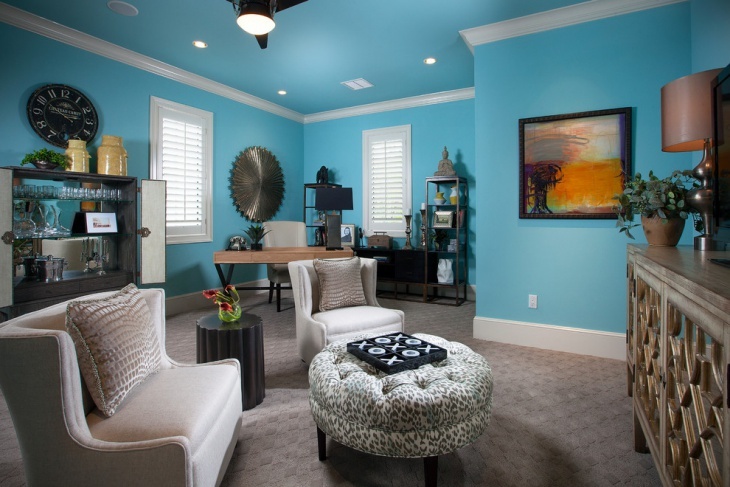 The elegance of this commodious blue office is unquestionable. 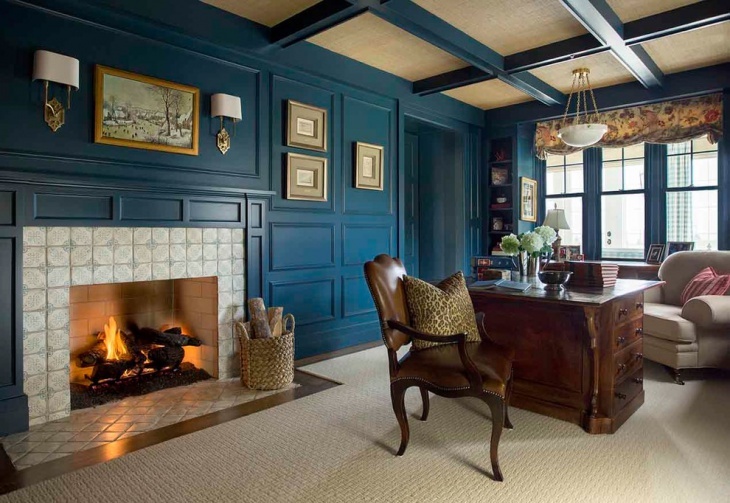 The dark-hued furniture blends well with the blue walls of the office. The modern office chair adds glamour and modishness of your home office while the captivating patterns on the floor enhance its look. If you find fascination in cars, then this style can be a good source of inspiration for your home office design. 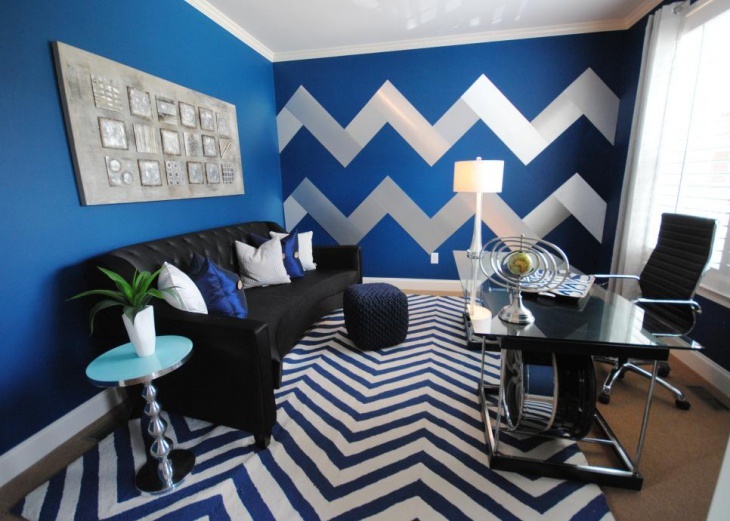 The white stripes on the blue walls and floor are really stimulating and attention grabbing. The blend of black and sparkly metallic furnishings makes the office elegant. 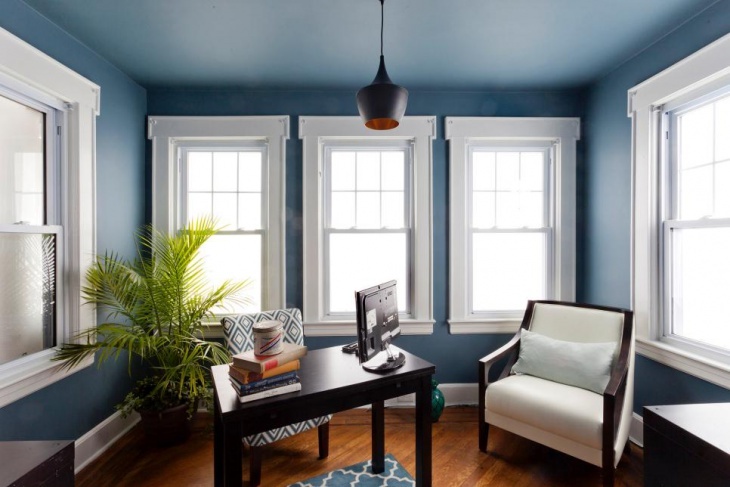 The blue colour tone of the walls gives the home office a desirable cool ambience. 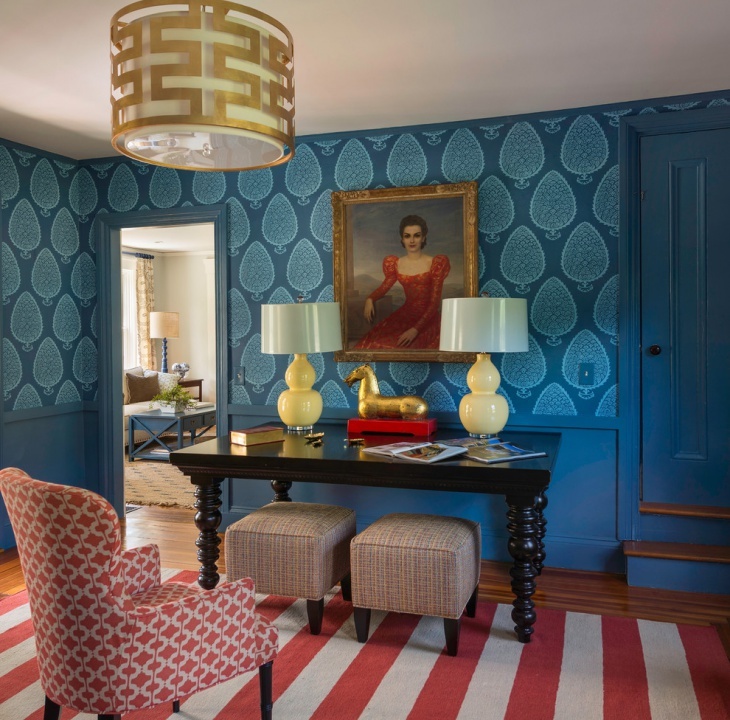 Art Deco inspired brass light fittings, the round braided grass sea basket and the hand-painted tiles enhance the beauty and uniqueness of this home office design. 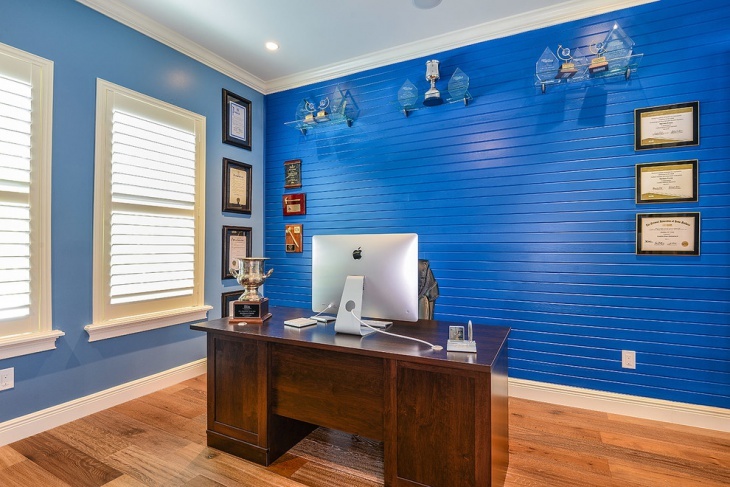 Nothing describes the calm of this spacious home office better than its blue walls. The Octavia large plaque gives the blue walls a contemporary artwork touch while the contemporary decorative accents augment the chic of the room’s modish furnishing. The traditional table lamps blend well with the other contemporary fittings. 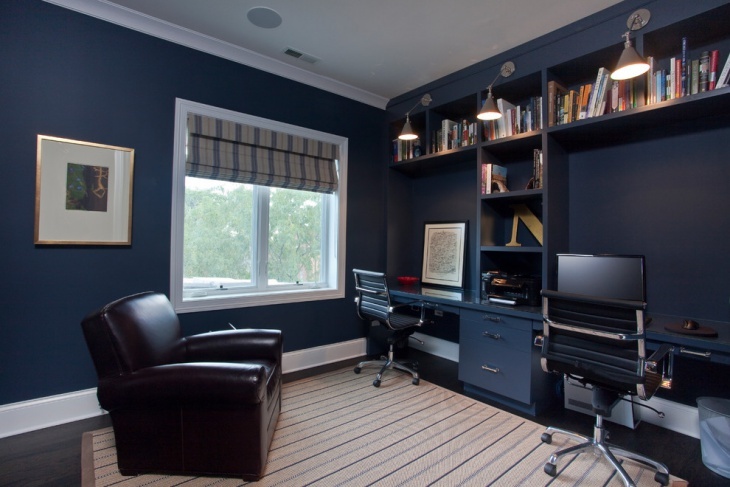 The dark blue walls add an element of power to this eclectic home office design. The white antique armchairs, the leather desk and a white horse artifact render the office quite dramatic. 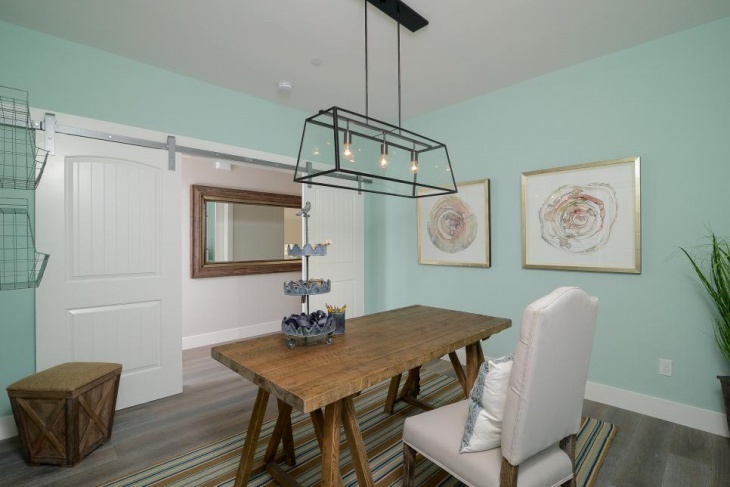 The zebra-patterned cow hide rug is perfectly distinct from the wooden floor while the large white chandelier hangs beautifully on the white ceiling. 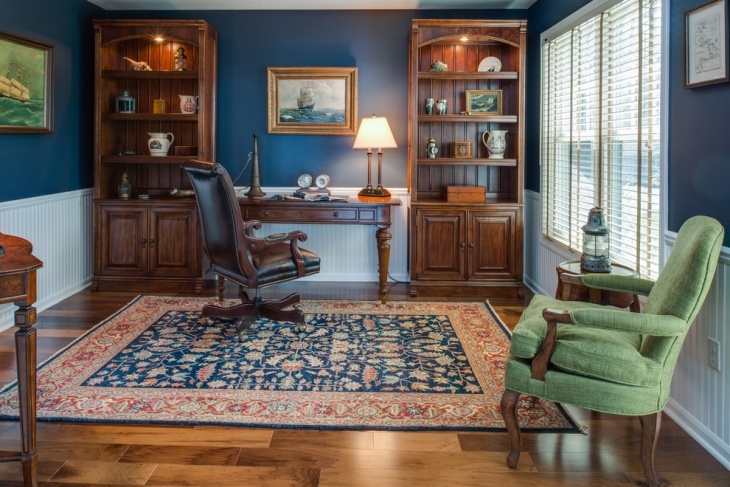 This spacious home office comes with a remarkable traditional touch. 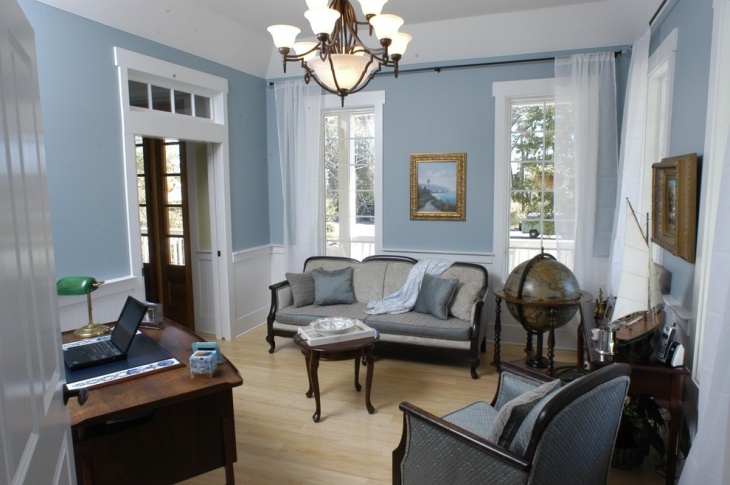 The pieces of framed artwork accentuate the blue walls while the large window enhances natural lighting to the office. The furnishings make this design befitting. Contrast created by the light-hued furniture and other fittings in this masculine coloured walls office is remarkable. This simple yet great looking design will not only give your home office a sense of peace but power and integrity as well. Nothing brings out a feeling of perfection and tranquility better than a blend of white and blue. And, this is the exact impression you’ll get out of this home office style. The simplicity of this design is stunning. If space is a limiting factor, then this design will befit you. The furnishings and décor of this design creates a soothing, relaxing ambience ideal for your home office. 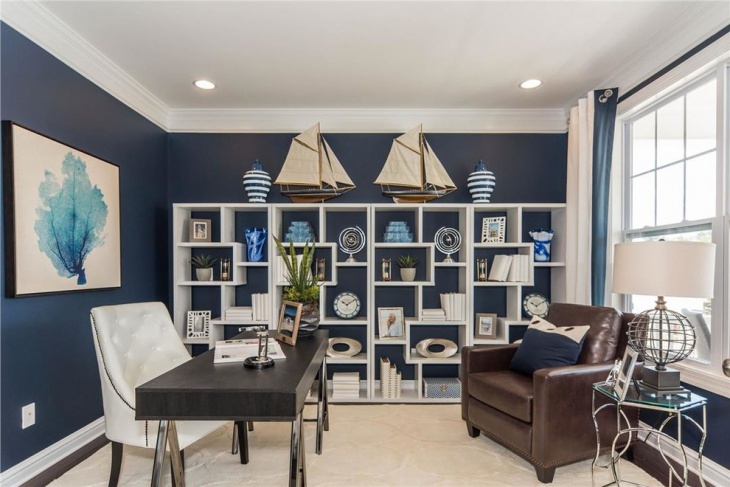 Whether your home office is meant for reading or doing some light office work and crafts, the place needs to be as relaxing and soothing as possible. This will give you sheer satisfaction. The assorted blue home office designs above open a plethora of options for you to design your personalised home office. 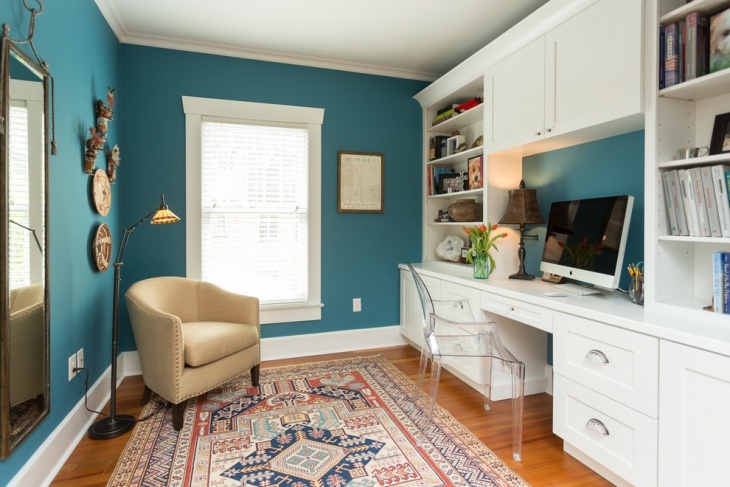 Consider the options and create your blue home office today.